At a packed house in the GreenRoots office Tuesday night, Congresswoman Ayanna Pressley said she would use her legislative power to help improve issues of transportation inequity for her constituents. The Chelsea Transit Equity Roundtable was one of a series of meetings Pressley is holding throughout the 7th Congressional District to gather input about the issues affecting the region, she said. Congresswoman Ayanna Pressley was on hand at GreenRoots Tuesday night to discuss Transit Equity in Chelsea and throughout the district. While the evening focused on issues surrounding public transportation and pedestrian and bicycling access, the Congresswoman did also touch on her thanks for local support from Chelsea, her first 100 days in office, and her gratitude for the activism of GreenRoots and other local organizations. Pressley said the idea behind the equity roundtables for transportation and other issues is to create an intimate space to actively listen to residents about their needs and concerns. Some of the highlights of the roundtable included discussions of transit challenges for the disabled, for cyclists, and for young people. Disability rights activist Colleen Flanagan pointed out that Boston and the surrounding area have taken steps to make transportation more accessible to disabled people, but that there is still a long way to go. She said price increases and attacks on non-emergency medical transportation are having a negative impact on disabled public transportation users. “We need to continue to show that access to transportation is a civil right,” said Flanagan. Pressley also talked about the public transportation issues facing young people, especially low income youth who rely on MBTA buses and the subway. One youth leader Pressley spoke with said she feels like she is punished because she is a low-income person who has no other options for transportation. Cycling educator and activist Gamal Smith made his way to the Chelsea roundtable from Chelsea on two wheels. “It’s faster and more reliable to be on two wheels for almost any distance” in the Boston area, Smith said. But while cycling can be faster than other modes of transportation, Smith said there are still many challenges for cyclists, including safety, with a multitude of roads that have no safe crossings for cyclists or pedestrians. Smith said the speed of getting around on two wheels also highlights the at-times substandard service of buses and other public transportation options. He said his son takes the MBTA bus to school, and it can wreak havoc on keeping track of schedules. “I shouldn’t have to wonder if it’s going to take my kid a half-hour or an hour when he comes home on the bus,” said Smith. Pressley encouraged anyone who wants to continue the discussion on transit equity, or equity on other issues, to use the hashtag #APequityagenda on social media. Soon Chelsea – like other cities – can “3-1-1” it. City Manager Tom Ambrosino said he hopes to proceed with introducing a 311 constituent services reporting platform to the City in the next fiscal year, which begins on July 1. Already, Everett, Revere, Boston and others feature a telephone and online/app 311 system that residents can use to report anything from a pothole to graffiti to a rabid skunk. “The goal is to provide better and more prompt responsiveness to constituent complaints,” read a letter from Ambrosino to the Council. Ambrosino said the system he has in mind would operate with two employees working out of the DPW building. They would field complaints from 311 by telephone, email, text message and web-based reporting. They would fall under the supervision of Public Works Commissioner Fidel Maltez. Once having taken the complaint, the employees would then assign the complaint to the appropriate department. That would open up a series of accountability measures on each complaint, he said. Start-up costs would look to be $162,000 for employees and the computer software. He said there is already $27,000 set aside for the program, and $50,000 from a state grant received last year. The remainder of the first-year costs would have to come from a budget request. “I hope the Council will see the benefits of this improved constituent services effort and approve the requested FY20 appropriations,” he wrote. The new system would replace the old SeeClickFix reporting system, which never worked as advertised. Superintendent David DiBarri is pleased to announce that the Massachusetts School Building Authority (MSBA) invited Northeast Metro Tech to participate in a feasibility study for its new building project. Northeast Metro is operating out of a more than 50-year-old building that requires educational, capital and maintenance improvements. The MSBA – a state agency that works with communities to support educationally-appropriate, flexible, sustainable and cost-effective public school facilities –= invited Northeast into the feasibility study phase to explore potential solutions to identified problems. During the feasibility study phase, Northeast and the MSBA will determine a project manager and designer to conduct a study of the current building. Once the study is completed, Northeast will then apply to the MSBA’s building project reimbursement grant program. 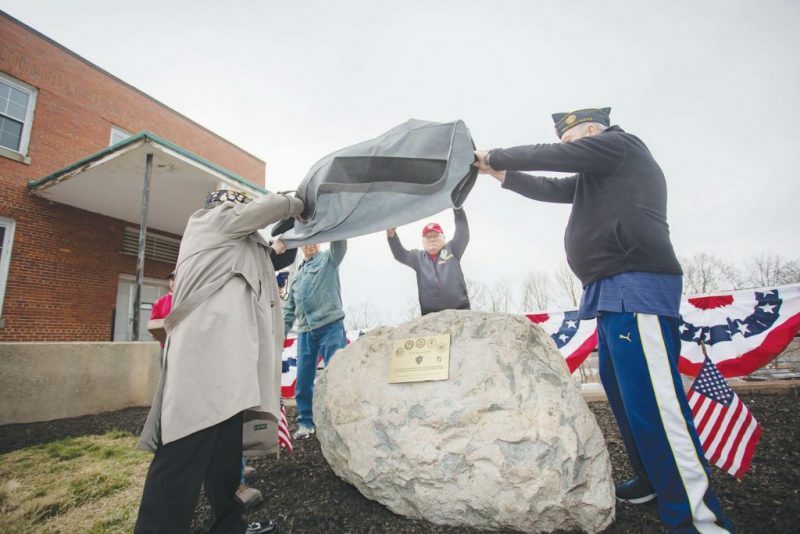 Vietnam veterans unveiling the boulder and a plaque during the Vietnam Veterans boulder rededication ceremony. The boulder has been moved from Malone Park to a new location between the Williams House and Vinnie’s Place due to construction on the campus. During the ceremony, Vietnam veteran Larry Clarke salutes as the names of those from Chelsea who died in Vietnam were read aloud. 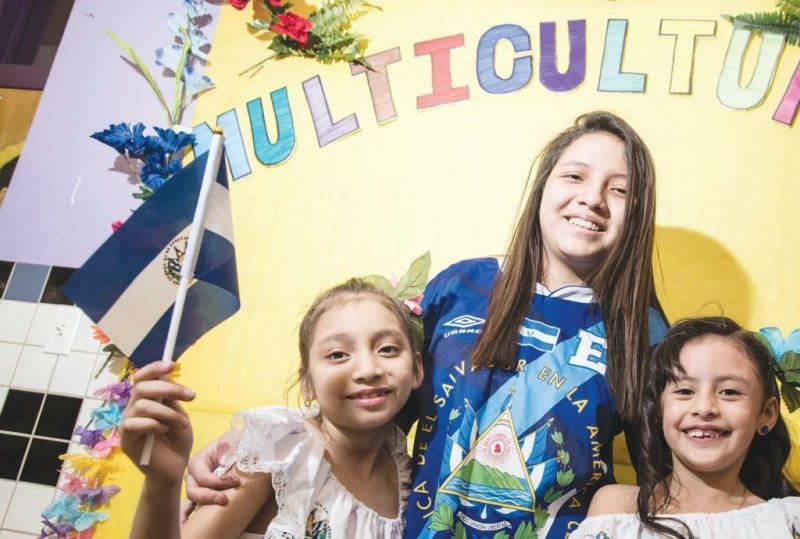 Allison Mendez, Damaris Martinez, and Gisele Ribas show off their Salvadoran pride during the Kelly School’s annual Multicultural Night on Thursday, March 28. Tables with food and cultural information was available for nations around the world. School Committee Chair Rich Maronski announced on Tuesday that he will be resigning from the Committee as of May 3 – citing that the frustrations with attendance at the meetings was getting in the way of his family life. Maronski has been on the Committee for four years, and was appointed at the time. He previously served on the City Council, but said his experience on the School Committee was much more frustrating – leading him to decide it was time to move on. Maronski was elected chair this year in his fourth year, and he was accompanied as vice chair by Julio Hernandez, who also resigned last week. While Hernandez cited family and school complications, he also said he left frustrated by the sparse attendance of some members of the Committee. Maronski said things started off bad from day one, when he showed up to take his appointed seat but not enough School Committee members showed up to form a quorum and have an official meeting. “I had to come back another night when there were enough members there to have a meeting,” he said. He also said he became severely frustrated two years ago when the Committee was faced with voting on a $1.1 million grant that would help save jobs for teachers that had been cut. The Committee only had to show up in enough numbers for a formality vote that accepted the grant. More recently, he said the Committee wasn’t able to get enough people to vote on the Superintendent’s Job Description, so the Search Committee had to work for a month with only an unapproved draft until they could get enough members at a meeting to vote. He said the Committee also plays an important role for supporting the kids in the schools. He said he would love to see a Committee where members are active and involved, supporting the kids at reading events, sporting events and concerts. “We live in a City where there are a lot of single parent homes and so it’s even more important the School Committee members show up to these kids’ events to support them,” he added. Maronski said he had all the respect in the world for the Central Office, the principals, the teachers and the buildings/grounds crews. He also said Supt. Mary Bourque has done a great job in a hard job. Dr. Deborah Wayne’s optometry shop has been on Broadway in one way or another since 1936, but in 2019 she’s hoping that new City guidelines and a store improvement program will help her shop – and others around it – catapult into the new century. She shares the enthusiasm of most of the business community on Broadway, who wholeheartedly support a set of design guidelines for the corridor, as well as a storefront improvement assistance program. Downtown Coordinator Mimi Graney has proposed the regulations this spring to the Planning Board, and had a hearing on April 1. They will have a stop at the City Council again with a ruling promised in May. One of the problems, she said, is that the regulations for signage and façade improvements are woefully outdated – in some cases not allowing simple things like a blade sign. A blade sign is a suspended sign that faces those walking on the sidewalk. Because of the outdated regulations, she said, many store owners are hesitant to make upgrades that could be a code violation. “The downtown has always been a bunch of things, but the rules never changed so it means the businesses can’t update or maintain their facades,” she added. Alberto Calvo of Stop & Compare Supermarket said they improved their façade and sign a few years ago, and it made a huge difference. He’s excited to see that happen throughout the business district. “I think businesses are most excited about the potential return of blade signs,” Mahoney elaborated, “those that are perpendicular to the building.” Newburyport’s shopping district is full of those signs. When one drives down its streets, one can see the businesses’ signs before accidentally passing them. Pedestrians also can spot their destination from a half-block away. •Another piece of the regulations addresses outdoor or sidewalk dining – which was pioneered by the Ciao! Market on Broadway two summers ago. It was a success, by most accounts, and Graney said they would like to encourage others to try it. First, however, they wanted to put some standards in place. The regulations would only allow such dining on sidewalks and they would have to be immediately in front of the business. The furniture would have to be matching and of a high quality. There would have to be a safety plan, and businesses would be responsible for the area. No alcohol service would be allowed for the time being. Seasonal heaters for outdoor dining are also being considered. Addressing the proposed sidewalk dining ordinance, Chamber Executive Director Rich Cuthie was slightly more cautious. Cuthie said there is no compelling argument for a business owner to make the investment in tables, chairs, and staffing while also having to insure against additional outdoor liabilities if the potential revenues to offset those costs are not there. 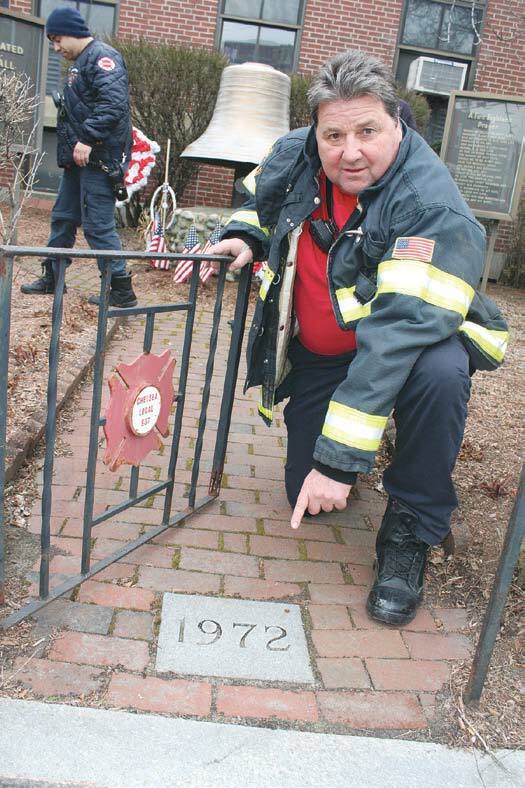 The Chelsea Fire Department has begun a major renovation project for the Chelsea Firefighters Memorial that is situated outside the local fire alarm headquarters. Chelsea Fire Capt. Michael Thompson points to the stone plate marking the original opening date of the memorial. The firefighters have launched a renovation project to restore the site. Fire Captain Michael Thompson said the memorial was first erected in 1972 and there has been no refurbishing at the site since that time. City Manager Tom Ambrosino met with Deputy Chief Michael Masucci to discuss the project. Ambrosino gave the official go-ahead for the project. Seeking to raise monies to defray the cost of the project, the firefighters will hold a “Chili Selloff” fundraiser this Saturday, April 6 at the Mystic Brewery, Chelsea. “Bryan Greenhagan (owner of the brewery) has graciously invited us to sell chili from 1 to 9 p.m. on that day, with the proceeds going to the rebuilding of the memorial,” said Thompson. Chris Flahive and his team of chefs from the Chelsea Yacht Club will team up with the firefighters to cook up 40 gallons of chili for the event. On April 13 at the New Brown Jug, owner Michael Matrinko will host a fundraiser during which 20 percent of all food sales will go the firefighters memorial fund. There will be a raffle drawing for a $10,000 cash prize. Every year on the first Sunday of June, the firefighters hold ceremonies at the site. Thompson is hopeful that the project will be completed by that date. (Donations for the project can be sent to the Chelsea Firefighters Memorial Fund, P.O. 505616, Chelsea, MA 02150). The School Committee passed a $95.4 million School Budget last week, but it was passed with less than a majority of the total number of nine committee seats. The budget, which passed with a $1.9 million funding gap that led to the elimination of 10 teaching positions, was approved by a 4-2 vote. School Committee members Rosemarie Carlisle and Frank DePatto voted against the budget, while board member Jeanette Velez and Chair Richard Maronski recused themselves from the vote, citing relatives who work for the School Department. Last week, Julio Hernandez resigned from the Committee and his seat has yet to be filled. School Committee members and administrators said it has been a long struggle to present a budget that attempts to meet the needs of the Chelsea schools. Supt. Mary Bourque and City Manager Thomas Ambrosino were among those who noted that falling enrollments in the Chelsea schools, as well as an antiquated state funding formula that underfunds urban communities such as Chelsea, were the main culprits in the budget cuts. That included the City providing an additional $1.5 million to the schools to address budget shortfalls. “Every new tax dollar I can raise in Fiscal Year 2020 is going to the School Department,” said the city manager. Regardless of how the School Committee ended up voting on the budget, Ambrosino said the $95.5 million figure is the figure he would present to the City Council as the school share of the overall City Budget. “The budget (Bourque) presented is fair and reasonable,” said Ambrosino. Once the budget is approved, Ambrosino said attention should be turned towards advocating for change to the Chapter 70 state education funding formula on Beacon Hill. Bourque said she agreed that the time is now to fix the state funding formula, noting that Chelsea schools will be underfunded $17 million by the state. The other factor leading to cuts in the budget is falling enrollment, Bourque said. Between January of 2018 and January of this year, she said Chelsea schools have lost 217 students. That is part of a larger trend of falling enrollment over nearly a decade, according to the superintendent. Carlisle voted against the proposed budget, but said the problem with the $95.4 million figure laid not with the City, but with the state. School Committee member Ana Hernandez backed the budget, but said it wasn’t a decision made lightly. But for DePatto, further cuts to teaching positions was a bridge too far to support the FY ‘20 budget. He said the schools laid off seven teachers in 2017, 20 in 2018, 10 in 2019, and have projected another 10 for 2020. School Committee member Yessenia Alfaro-Alvarez voted in support of the budget, stating that it was in the best interest of the City’s students to pass the budget, and also noting that Chelsea is hamstrung by declining enrollments and inequities in the state funding formula. •In other business, the Committee voted to forgo School Choice for the 2019-20 school year. •The School Committee also approved a field trip to New York City for high school and middle school REACH students to participate in the Andover Bread Loaf Writing Conference in May.